When using up fruit which is past it’s prime, I usually opt for good old-fashioned stewed fruit and custard. This time, I included the stewed fruit as a filling for these tarts. 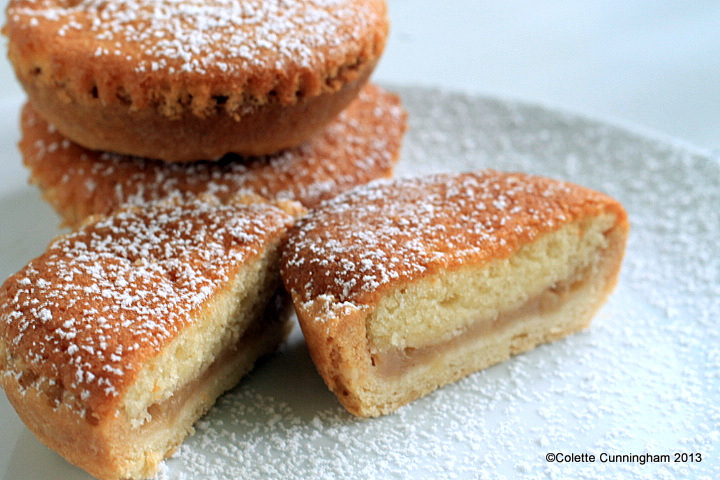 The method is the same as that of a Bakewell tart, but that is where any similarity ends! This recipe requires both shortcrust pastry and sponge mixture. 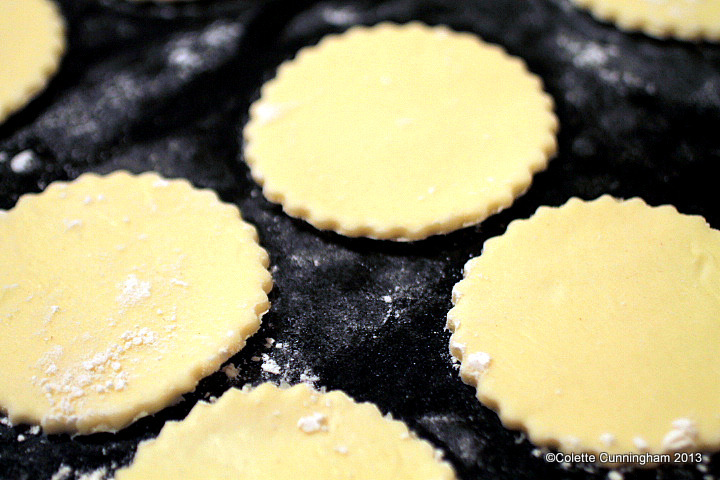 To save time, you can use a ready-made pastry for your tart bases. To stew the fruit, peel, core and chop, 3 pears and 2 apples.and place in a saucepan, along with ¼ teaspoon of ground cloves, and ¼ teaspoon cinnamon. Add 3 – 4 tablespoons of water, and bring to a simmer, cook until the fruit is very soft, and has a sauce-like consistency. Allow to cool completely before using. Pre-heat the oven to Gas Mark 4/180C/350F. (You will need 24 paper cases, in total, for this recipe). Butter and flour a 12 hole baking tray. Using a 7cm scone cutter, cut out 12 discs from the pastry and gently press into place, one in each cup. Prick them with a fork. To bake blind, place a paper case onto each piece of pastry and fill with baking beans or rice. 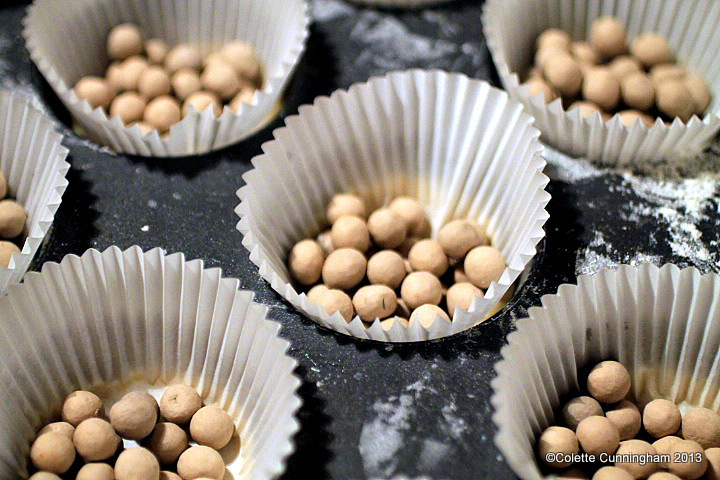 Bake for about 10 minutes, then remove the baking beans and paper, return the empty tart bases to the oven, and continue baking for 10 – 15 more minutes, until they have dried . Allow to cool before filling with the fruit and sponge mixture. In the meantime, prepare the sponge topping. This is my Mother’s bun and sponge recipe which I halved. Add the egg, and a large spoonful of the flour in on top, beat again, add the rest of the flour until it has become fully incorporated . Next add the milk, and the Vanilla extract and beat this through the mixture. 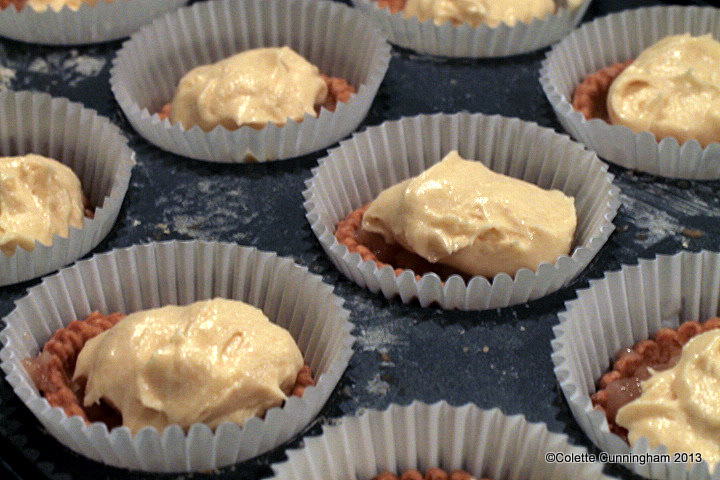 Remove the cooled tart bases from the baking tray, and fill with 12 fresh paper cases, place the tarts inside each one. Add a teaspoon of the stewed fruit to tart base, followed by a teaspoon of sponge mixture. Bake at Gas Mark 4/180C/350F for between 15 and 20 minutes, until the sponge has cooked through and golden brown on top. Previous Post Other Bits! Dissociation from who actually “owns” a recipe! Thanks for your comment. Let me know how you get on if you do decide to try them.